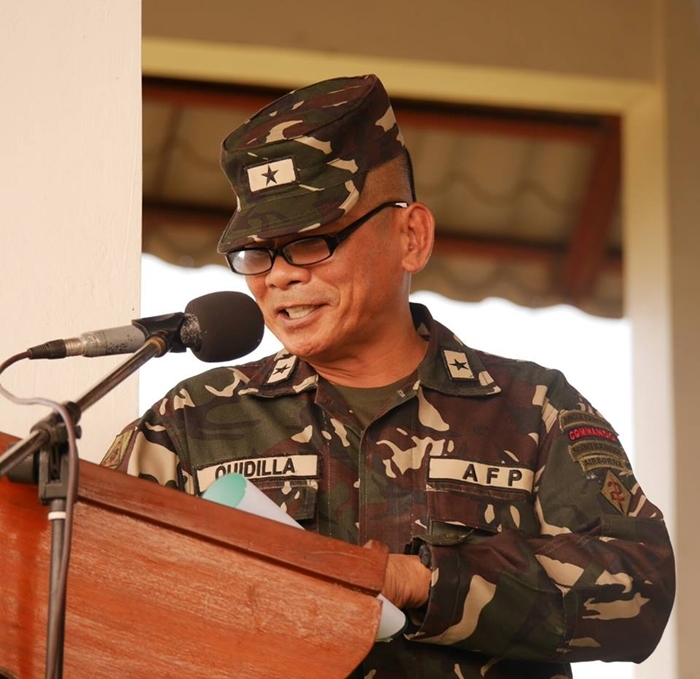 A snappy salute to Brigadier General Ferdinand F. Quidilla, a South Cotabateño, who was recently installed as the new commander of the 9th Infantry Division of the Philippine Army located in Bicol Region. BGen. Quidilla is 54 years old, and was born in Banga, South Cotabato. He finished his secondary education in Notre Dame of Banga and his tertiary education at Feati University with the degree of Bachelor of Science in Aeronautical Engineering. In 1979, Quidilla entered the Philippine Military Academy and graduated from the “Most Premiere School in Asia“ on March 11, 1983. He belonged to the Philippine Military Academy “Matikas” Class. Brigadier General Ferdinand F. Quidilla as new 9ID commander. Photo from Facebook. Prior to his current position, BGen Quidilla was the Assistant Division Commander of the 2nd Infantry Division in Tanay, Rizal. He replaced Major General Yerson E. Depayso who was retiring from the military service.